I know that this isn't going to be very much help this time of year. 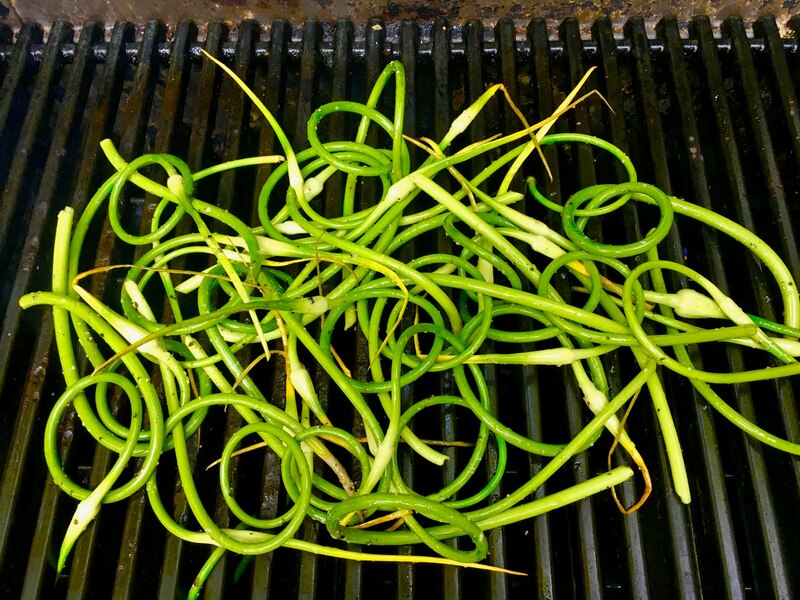 After all, where are you going to find garlic scapes in August? Thing is, either I share with you this quick and easy way to prepare the things or I don't. So what if it'll have to wait til next summer before you try it. You're in a hurry or something? These aren't the last of my garlic scapes. I harvested all 230 or so of them in late June and still haven't used them all up. They're stored in a refrigerator in the basement and so I often forget that they're there. Good thing they last a while before going bad, a good couple months if not longer actually. For those of you who aren't familiar, the scapes are the flower bud of a garlic plant. They're removed in early summer to help strengthen the garlic bulb. If you didn't remove the scape a flower would grow out of its tip. 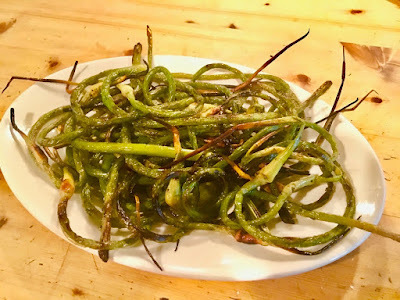 Garlic scapes are used in all kinds of ways, as they taste just like garlic. 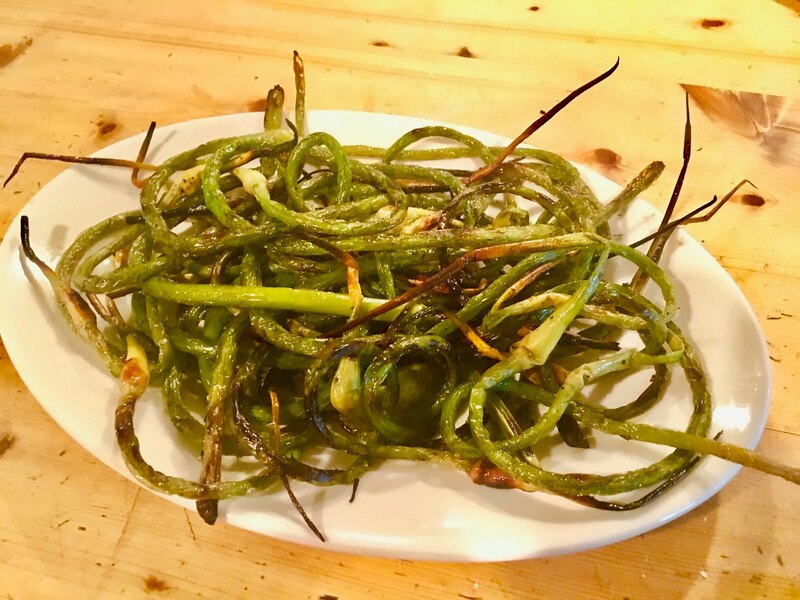 But my favorite way to use them is straight-up grilled or roasted and served as a vegetable. As the weather has been pretty warm these past few weeks I've been loathe to turn on the oven, so the gas grill outside has been getting a good workout. Don't worry about paying careful attention here, okay, because there really is nothing to this at all. 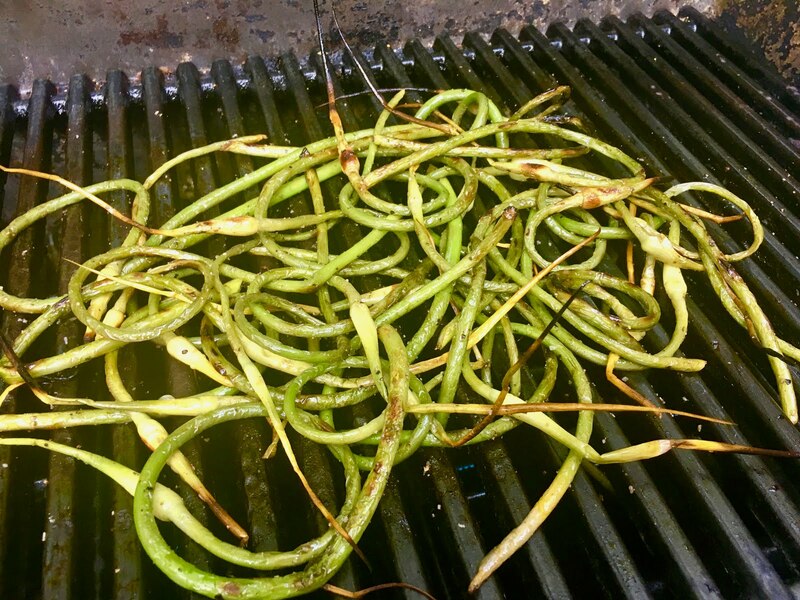 Just toss the scapes in olive oil, salt and freshly ground pepper. Throw them on the grill, preheated to around 350F or so, and put the cover down. 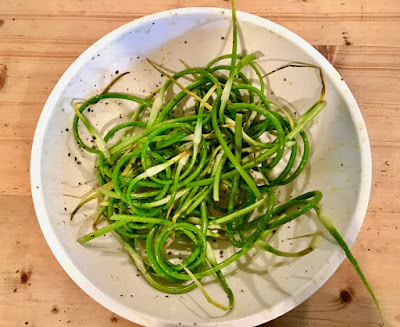 Toss the scapes around a couple times until they're softened and a little charred, which shouldn't take more than 10 minutes or so. Now all you have to do is get out your smartphone, tap into the calendar app, and put in a reminder for early next summer to give it a go. Unless, of course, you live nearby. In which case you can just swing by. 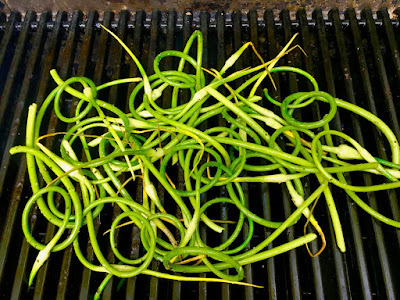 There's still a batch of scapes left in the basement fridge, and you're welcome to them.